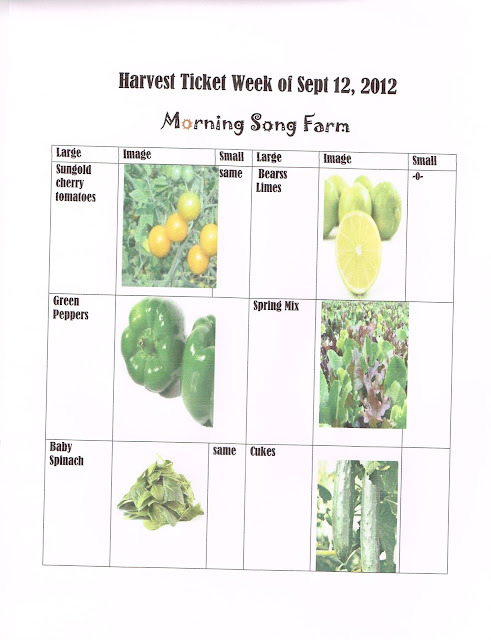 Come on out to Morning Song Farm for the first of a series of cheese making classes. A series of three classes, you can choose all three or just one. Each class will be held the third Saturday of the month starting October 20; from 9 to 12:00. Get a chance to meet the farm’s beautiful Nigerian dairy goats, pet the babies, and join in a 9:00 sharp milking demonstration. 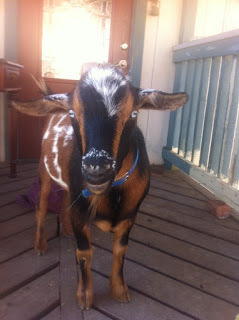 (Our goats don’t like to wait around for anyone;) Bring a crunchy granola bar or two and you’ll be everyone’s best friend, especially Carl The Herd Leader who eats anything but really gets excited if it’s crunchy. 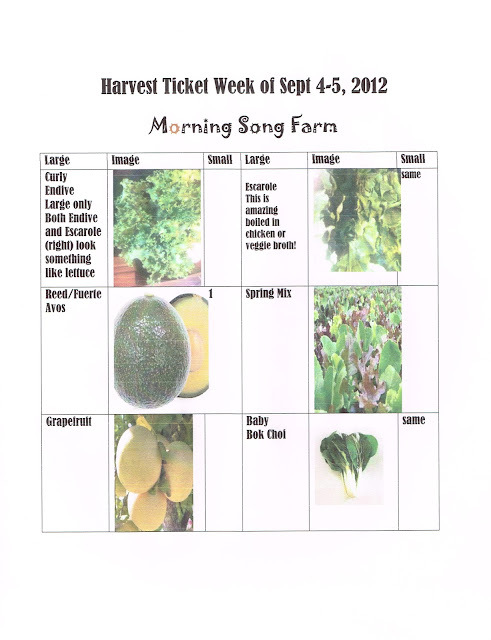 I’m pretty excited about the enhanced quality of our Harvest Ticket this week. Ever since starting our blog here at www.blogspot.com, we’ve had problems downloading images created in Word, which is where I’ve found it’s easiest to create our tickets. I’ve jumped through all kinds of hoops, and blogspot usually says it’s not in the right format. The only way I could figure out how to get blogspot to accept the image, was to scan and save it in a format blogspot would accept, with an unavoidable, ensuing quality reduction . I’ve just discovered Gimp2, which is a free software program that can change formats, and it works! Frankie says, "Mom, stop the new eggs orders!" OK, son Frankie--always interested in all thinks related to economics; is excited to see that his allowance source (the egg "division" here at Morning Song ) has demonstrated an equilibrium between supply and demand. We've taken on 5 new orders; and until our juvenile chickens are laying consistently in a few more months; he says we can't fill any more. 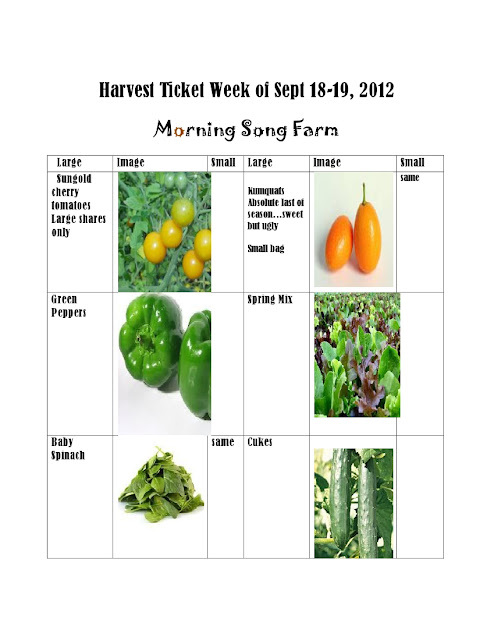 I've posted a second harvest ticket this week because we had to switch things around a bit between Tuesday and Wednesday. 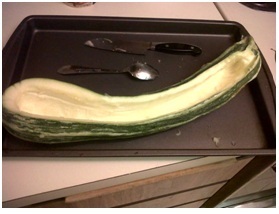 Only Tuesday large share subscribers received the giant zuchs. I'm going to allow our zuch garden to provide another batch of giants, and hand out to Wednesday large shares either this coming week or next. Eggs! We now have increased our egg productin to the point where we can accept 5 or 6 more orders a week! If you'd like to have a weekly dozen or half dozen added to your CSA box, email us! 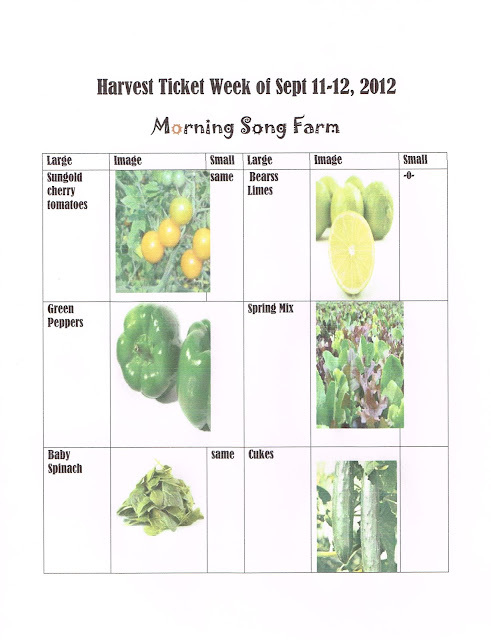 We're excited to have our late Sungold tomatoes in this week's shares for all. They're among the sweetest cherry tomatoes we can grow, and we grow them every year. We're just beginning to harvest limes, at last. You'll find them only in the large shares, and in a couple weeks, we hope to have them across the board. This is the last week for Asian pears. We don't have ladders tall enough to reach the highest parts of our pear trees, so the highest fruit is now being pecked by birds. We had plenty to put in all boxes for weeks, so don't mind sharing a few hundred pounds with the birds. They have to eat, too! In a salad bowl, toss your endive, onion and olives. In a jar with a tight-fitting lid, combine the oil, vinegar, oregano, mint, salt and pepper; shake well. Drizzle over salad and toss to coat. Tpop with cheese. OK, I know it's uncool to publish an unharvested harvest ticket; but I'm heading out of town on the worst possible day of the week to head out of town; (yet another stab at trying to get my ongoing divorce handled; 4.5 years and counting) and wanted to have some sort of post available. So, yeah, I may have some items wrong--I'm hoping to get basil in boxes this week; but the heat has made our field iffy--I watered well last night and hope to get at least small bunches in boxes this morning in my absense.. Also, we have a couple new items: curly endive which is spicier, and tougher than regular lettuce; and escarole; which is amazing boiled in chicken or veggie broth; but can be consumed raw as well.